This year I decided not to grow so many varieties of potatoes. The plan was Arran Pilot (First Early), Charlotte (Second Early) and Orla which is an early that can be left to grow on like a maincrop along with Sarpo Mira – blight resistant maincrop. I picked up 2 kilo pre-packed bags of Arran Pilot and Charlotte but couldn’t find any Orla. So decided to grow Estima instead of Orla. It’s a pretty good cropper and nice all-round white potato. I picked up 3 kilos of Estima, it’s supposed to be a second early but I’d say its more of an early maincrop. Back home I opened the Arran Pilot and wasn’t very happy to find they were large seed potatoes and quite sprouted. Thanks, Wilko. There were 17 tubers in the bag. The Charlotte were fine – 25 tubers which is about right for 2 kilos. 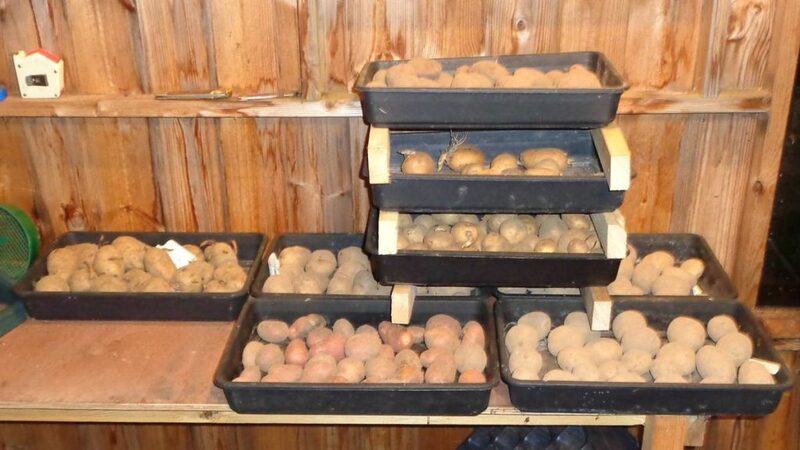 The Estima were from a garden centre and picked individual tubers, 48 in my 3 kilos. Back home I set them out to chit in the potting shed and then went to the big shed crop store. The potatoes needing checking anyway so each sack was emptied and inspected. Nearly all were fine except for one sack of Blue Danube that had some rotters. They’re in the hotbin now. More than enough small Mira for my seed needs and I found a quarter sack of Orla. I thought they were all gone, so I’ve some Orla seed after all. Right at the back I found a few more tubers, I think Arran Pilot but I could be wrong. They’re sprouting so I’ll plant them and see, what’s to lose? Bench space is at a premium in the shed – stuff expands to fill the space available being an unbreakable law of nature that is yet to be explained. I usually chit my spuds in seed trays so I thought about building a rack to hold them. Then I realised all I need to do is run a couple of bits of scrap 2×1 across to support the tray above. Much simpler and quicker. The onions have been a real disappointment. The crop did really well but after the long hot summer, the rains came just before harvest. Couldn’t have been a worse time. Just when you want them drying out, suddenly they’re sucking in water. Although I thought I’d dried them out thoroughly, a lot have rotted in store. I’d actually moved the drying rack into the big shed and set a fan going to blow air over them. Once again the hotbin composter was fed, nothing is totally wasted in a garden. I’m starting the garlic in 3½” pots this year – they’ll go in the coldframe until they show and then get planted. The Early Purple Wight have arrived but the Solent Wight are delayed in transit. Not the best start but that’s gardening! Outside in the brassica tunnel, one of the purple cauliflowers (di sicilia violetto) was ready. Nice looking but the flavour is a bit average. I’d picked up the seeds on clearance – can’t really go too far wrong at 25p! I’ve grown Purple Graffiti in the past which has a deeper colour and better flavour. 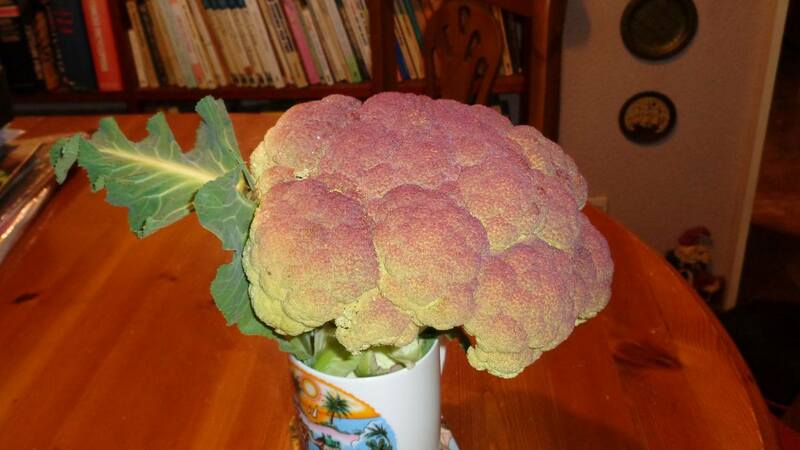 Still, the purple space cauliflower impressed by grandson .. an alien brain! It does look a bit like a brain. The stalk and leaves have amused and fed the hens for 3 days. With the weather keeping them undercover in the run, it’s important to avoid boredom which can lead to fights. They just love having something green to eat as well. When I sorted out the walled veg plot last year, I dug up some daffodils that had been left to their own devices for about 30 years. Split the bulbs and put them in a bucket in the shed, which I forgot until November. They got planted in the back border. 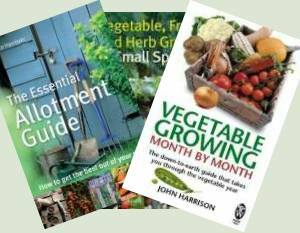 Unlike daffodil bulbs you buy, some of these were tiny, like a small onion set. None were above the size of a shallot. Well, size isn’t everything and they’re coming through already. I suspect actually being in decent soil will do them the world of good. 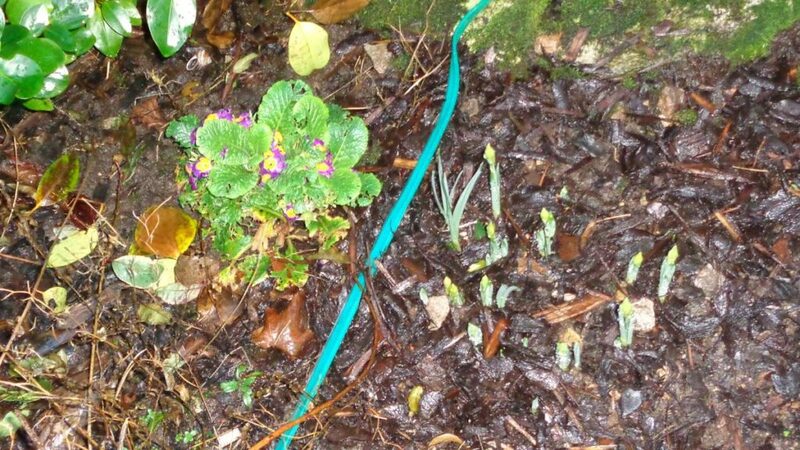 Amazingly there was a primrose in flower. The winter’s been mild so far, but we’ve had some snow and hard frosts. On the patio we’ve even got a potted fuchsia in flower! 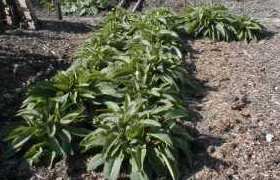 ‹ White Beetroot amongst the red beets – What Causes White Beetroots? 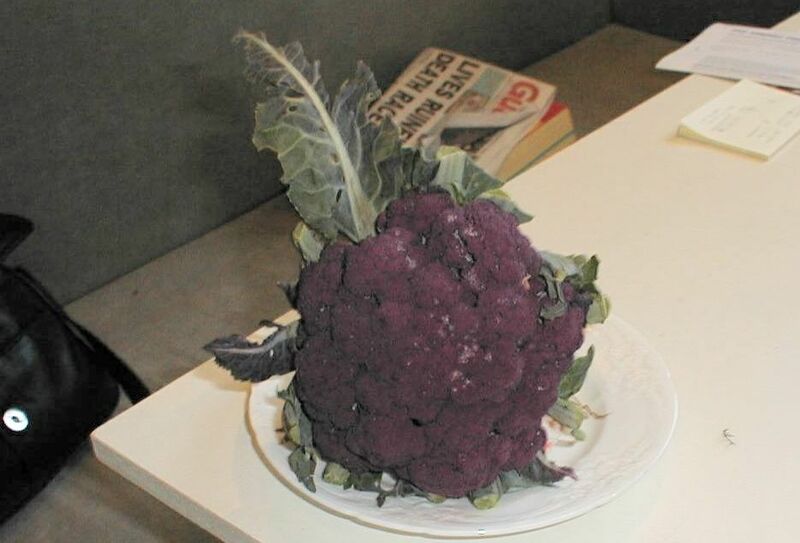 Purple caulis are just a bit of fun really – my favourite white cauli is Galleon. 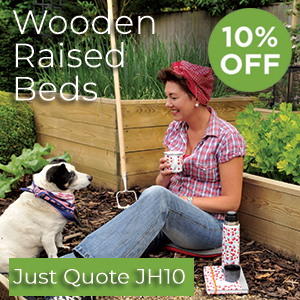 Grows well, stands well and tastes well – what more can you wish for?